The median age of the Mountain Resources Commission (MRC) region population has increased by 2.6 percent during the past decade – more than 65 percent faster than the statewide increase of 1.58 percent. 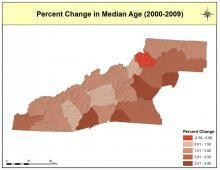 The only county in the region where the median age has decreased during the past decade is Watauga County, where increased university enrollment resulted in a 2.3 percent decline in median age over the past decade. The median age in Polk County increased the most over the past decade, at 4 percent, followed by increases of 3.9 percent in Transylvania County and 3.8 percent in Burke County. In Jackson, Avery, and Buncombe Counties, the median age has increased at a slower rate than the state as a whole, with increases of 0.6 percent, 1.4 percent, and 1.5 percent, respectively.